Go for it Eddie, but I think you may need to buy so many peripherals for it so you can use it comfortably, that you may be saving a bit but sacrificing a lot. wouldn't a simple shoulder mount solve this problem? Take a look at the other photo in that report of the guy holding it in one hand - does that look ergonomic to you? Easy to use? Functional? i don't know if you noticed but in that picture he's not holding the camera with one hand, he has a shoulder mount strapped to his shoulder. Is there something i'm missing? Wouldn't a simple $100 shoulder mount be a reasonable solution for making an ergonomic setup? BUT I have tried my GH3 with a MTF adapter and my B4 mount Canon HD and SD lenses. It is OK but not as sharp and crystal clear as my panasonic, Voightlander or Nikon lenses. The doubler on the Canon lenses are ok but it does produce less sharpness - and it does on the B4 mount cameraes too. Filming in high contrast makes some chromatic aberration. It is usable, but this combo is certainly not as light sensitive as my Voightlander lens. Maybe Metabones will make a Speedbooster someday that will work. There is adapters for powering the lens. The GH3 makes footage that is quite as good as my much bigger and a lot more expensive cameras, do. I used B4 lenses with adapter on my GH2.. in a modified shoulder rig to make it more in the shapefactor that you would want it to be. I mostly did this because I was used to shoulder cameras.. You can offcourse make a very different rig without too much trouble.. (or buy one).. I was fairly happy with the pictures it provided, I used this as a "cheap" way to get a HD shoulder camera..
Offcourse, he is using a modern HD wideangle lens, which in terms of quality is MILES above the 13x9..
You can see that the corners are quite soft, this is a downside to using this method.. I have shot a number of wedding videos with multiple GH2s. I cannot imagine trying to do one with a single one, regardless of the lens used. Sure it could be done, but is that really what you want to do? The logical choices for a wedding lens would be the constant aperture F/2.8 lenses made by Panasonic, not the ridiculously slow 14-140mm zoom lens. I sold mine after one event, they are worthless at a wedding reception. Even outdoors on a cloudy day it will not look like much. I've seen plenty of wedding videos shot with the lens, and I've not been impressed at all. Eddie you mention you are not worried about manual focus too much. If you have shot run and gun in all manual mode, particularly non-repeatable events like weddings, and if you've been successful, my hat is off to you. All this talk about exotic or do-it-all lenses is worthless come a bride's wedding day. If you are shooting for friends, for free, or for a very low price, you can get away with anything. If you need to supplement your income, I personally would go the route of a high quality, inexpensive videocamera or better yet two videocameras. Do you really want to be fiddling with focus during the vows, ring exchange, the first dance, the entrances and exits? If you have the skills, go for it, but I wouldn't do it. The GH2 as a second cam, maybe or even as primary, but you need a backup to cut to while you're trying to get your focus or moving around. The new HF G20 is wonderful in low light, costs around $1100 and your pretty much set, no lens issues. It's not only easier, but if you have not shot weddings before, you don't want to learn on the GH2, in my opinion. So I guess the GH2 is not the ideal camera for me.. I guess my dreams of shallow DOF and good low light performance were not meant to be.. It seems that every wedding I go to I see some guy with a DSLR with a shoulder mount rig, but you're right in that this is definitely not the easiest way to go. BTW thanks for the welcome everyone and thanks for all the advice, I will have to continue to do my homework. Lumix F2.8 lenses are little higher in price, and if I need a B-cam that adds more to the cost. Initially if you went with a GH2 you would want a videocamera as backup. The Olympus 14-54mm F/2.8-3.5 is a great starter lens for the GH2, a tad slow for receptions, but it can be used nevertheless. You retain autofocus, etc. You could also do a lot with a Panasonic 25mm F/1.4 prime. You'd have your DOF. The cam and lens would run under $1000. If you buy a videocamera you'll need a light, shotgun, and an audio recorder or wireless mic. You could start with that and then add the GH2 later. The primary thing with your lack of experience with weddings, is to really understand what you are getting into filming weddings. They cannot be shot a second time, which is why initially you don't want to be learning how to operate a camera and how to shoot a wedding at the same time. With a videocamera you can learn the ropes, and add a DSLR later. If you do start with a DSLR style camera, your learning curve would be at the customer's expense, unless you did a number of free ones for learning experience. You could get to where you wanted to go if you started with a GH2, but it would be brutal, unless you are an extremely fast learner. I still remember my first season with DSLRs, it was the hardest year of my life, I had no videocameras to use as backup. 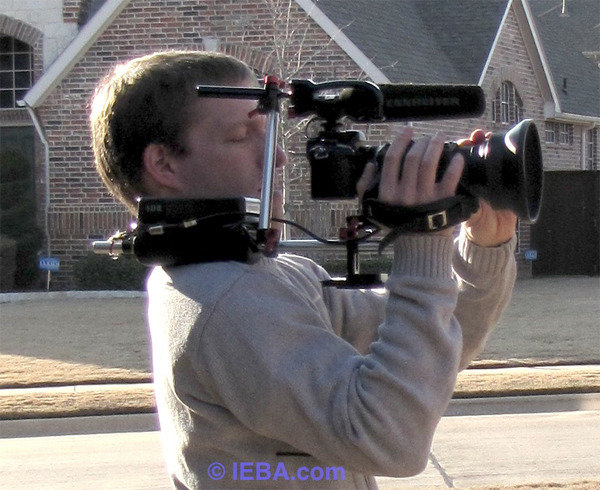 wouldn't a simple shoulder mount solve this problem?i don't know if you noticed but in that picture he's not holding the camera with one hand, he has a shoulder mount strapped to his shoulder. Is there something i'm missing? Wouldn't a simple $100 shoulder mount be a reasonable solution for making an ergonomic setup? Wrong pic - the other one. No, a simple shoulder mount wouldn't. Try this at home in daylight. Hold the camera, zoom and focus without a tripod. Try and see what you're doing in the LCD. See how long you can do it for steadily. Do you need an EVF like a DP4 with hood? Now, what are you using for sound - onboard mic is useless at any distance over a metre so you need a boom, beachtek/juiced link, maybe rads. Do you need a camera light? As Jeff says, buy a videocamera for your main shots and experiment with a small zoom and a Gh2 for the creative shots to intercut. That way you can get what you want. I have shot one wedding before (with a Sony Z1U), and I already have a wedding shoot I was gonna do for free lined up in April, but yeah it does sound like DSLRs are too much of a pain to use for the primary camera. If I got the GH2 yeah I would have gotten a hooded viewfinder for daylight. Viewfinder, GH2, shoulder mount, would still have been less expensive than a AF100 (but of course AF100 has built in ND filters). For sound, I was just gonna stick on a shotgun on the top, get a sennheiser wireless lav and have key people wear the lav at key times. Could have stuck a 3.5mm to 2.5mm on the sennheiser receiver. It's just strange to me how all these DSLRs shoot great video, and you even have camcorders with the same imaging technology like the AF100, yet no 10x zoom lenses with smooth servo zoom, and fixed aperture that's fast enough for low light indoor shooting. I guess the camera companies figure that for run and gun you wouldn't want a shallow DOF camera like the AF100 or FS100. edit: Sorry, I might sound stupid for saying this, but which pic are you're talking about? So you're not talking about this pic? Because this is the only one I see. Last edited by Eddie Yamashita; March 21st, 2013 at 04:29 PM. The large imaging chip requires a hefty zoom lens to get what we are used to in video cameras that use smaller chips. Look at the average 10:1 constant aperture par-focal zoom lens on a 2/3" chip cameras like the networks use and imagine what a zoom lens for an average DSLR which has a bigger chip would need. It's going to be big and heavy and you can't just attach it to the camera body, you will need support accessories. Good zoom lenses for broadcast cameras can easily cost more than $2000 so imagine what we have pay for something like that for our DSLRs. We are talking 35mm motion picture equipment prices. Panasonic seems to be putting good R&D into improving the lens choices we have for shooting video on the GH series but nothing is going to compete with a $1500 video camera for a while. I think this would be a good smooth zoom at ceremony but overall coverage, camcorder is way to go. I'm also in Irvine, hit me up if you have question with setup. so it's looking like canon xa10 and possibly a gh2 or gh3 as a second camera. gonna have to save up.. :( for shallow DOF maybe i can rotoscope a blur filter in after effects lol. Take a look at the FZ200 for under $600. 24X zoom at a constant f2.8.